The plan details provided here are indicative, check the exact details with your service provider before recharging. Recharge plans mentioned her is purely informational. These are subject to change by your service provider without any prior notice. Oneindia Recharge Services will not be liable in case the user doesn't get the benefits mentioned here. Recharge your Mobile/DTH/Datacard online using recharge.oneindia.com and pay with mobikwik wallet. Oneindia is India's #1 language portal and now brings to you recharge.oneindia.com through which you can recharge Airtel, Vodafone, Idea, Tata Indicom, Reliance, BSNL, Aircel, Tata Docomo, Tata Sky, Dish TV, Reliance Digital TV, Sun Direct, Videocon d2h and Airtel Digital TV, Tata Docomo Photon Whiz, Tata Docomo Photon Plus, Reliance Netconnect+, MTS MBlaze, MTS MBrowse, BSNL and Idea 3g netsetter. Online recharge helps save your time. Find out the best plans and top talk time plans using recharge.oneindia.com. Recharge your prepaid mobile/dth/datacard online through Visa & Master Card anywhere anytime. 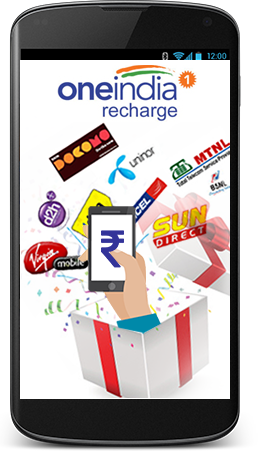 Our focus at recharge.oneindia.com is to make transactions fast, simple, secure and reliable.